General information | See you in Ukraine! Trident (tryzub). The official coat of arms of Ukraine is a golden trident against an azure background... And even more information about Ukraine. Trident (tryzub). 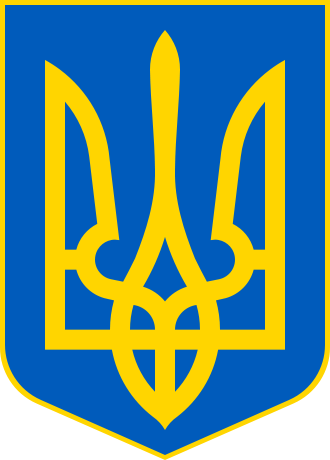 The official coat of arms of Ukraine is a golden trident against an azure background. The Ukrainian flag is composed of two equal horizontal bands of azure and golden yellow colors. It represents ripe wheat growing under the blue sky. Ukrainian language is the state language of Ukraine. The majority of Kyiv’s citizens also speak Russian. Personnel in most hotels speaks English while personnel of high class hotels speaks several European languages. 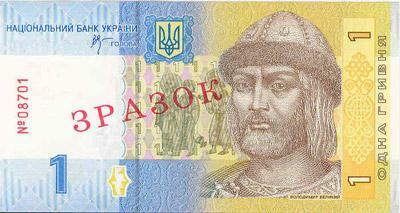 The National Currency – Hryvnia, Hryvna or Hryvnya (UAH) – was introduced in September, 1996. There are bills for 1, 2, 5, 10, 20, 50, 100, 200 and 500 Hryvnias. Kopiyka. 1 Hryvnia = 100 kopiykas. There are coins for 1, 2, 5, 10, 25, 50 kopiykas and 1 Hryvnia. Ukraine is the biggest only European country in Europe (Russia is much larger, yet has also Asian territories). It is divided into 24 regions (oblasts) and the Autonomous Republic of Crimea. The country has access to the Black and Azov Seas, and includes two mountain chains: the Carpathians in the West, and the Crimean Mountains in the South. Ukraine is a state in Eastern Europe, bordering on the north with Belarus (952 km), on the northeast with the Russian Federation (2,484 km), on the west with Poland (542 km) and Slovakia (98 km), and on the southwest with Hungary (135 km), Romania (608 km), and Moldova (1,194 km). The state border extends for a total of 7,698 km, and the length of Ukraine's sea coast is 1,758 km. Kyiv (also known as Kiev), was founded by the three brothers Kyi, Schek and Khoryv, and their sister Lybid more than 1,500 years ago, 482 A.D. With an official population of about 2.6 million, Kyiv is a large European city. 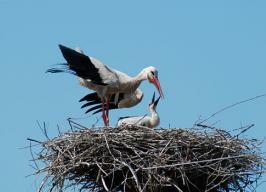 It is located on the banks of the Dnipro river that flows into the Black Sea. 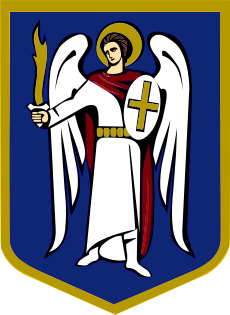 The Kyiv Coat of Arms depicts the statue of Archangel Michael who is considered to be the protector of the city.